It’s been a little while since I posted a beauty post! 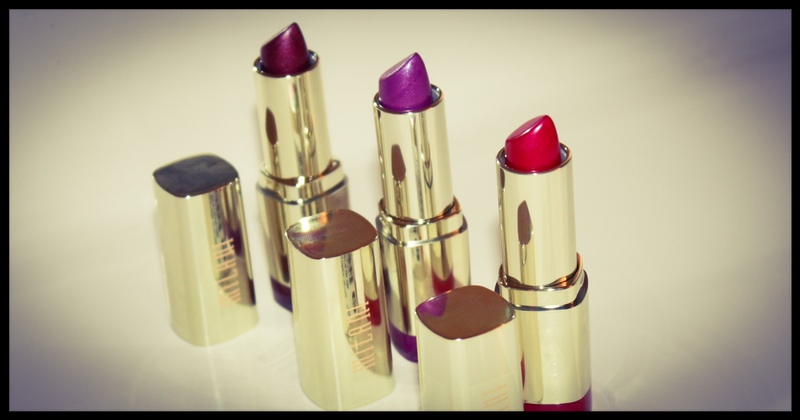 When getting my Riddler costume together for Halloween this year, I knew I wanted to pickup a bright purple lipstick. I found a shade I was happy with at my local walgreens in the Milani Color Statement Lipstick #34 Violet Volt. 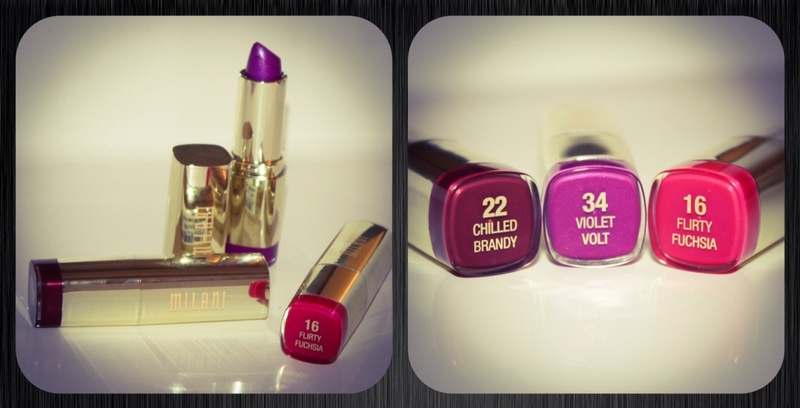 Although VV wasn’t on sale, a few of the other shades were so I scooped up two other fabulous shades as well: #22 Chilled Brandy and #16 Flirty Fuchsia. I’m very happy with all three! I had never purchased any products by Milani before this but I’ve heard some fabulous things about their stuff from my friend over at Fancieland. 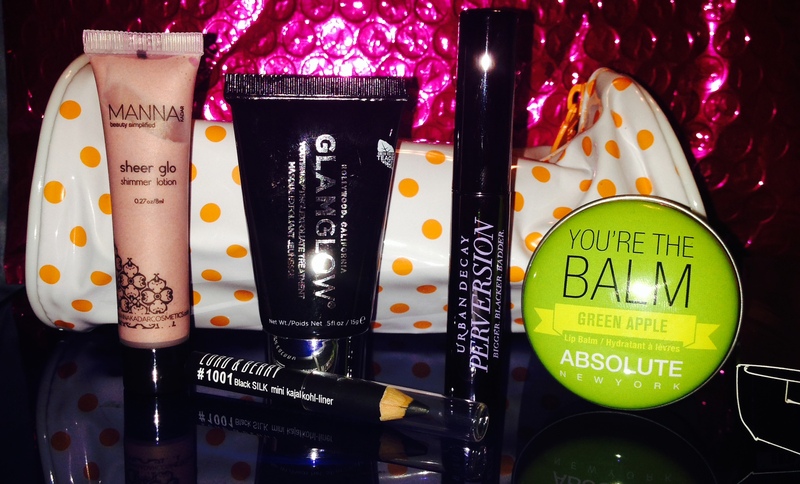 I’ve had a lot of fun sharing my monthly glam bags with you guys! The set I’m most happy about is the Tarte Discover The Amazon 3-Piece Kit in Fair. First off, the bag is adorable! I love it! It’s a lovely addition to my beach bag and could even be used as a fun casual clutch to a pool party or something. I don’t normally get this jazzed about free makeup bags but I’m weirdly obsessed with this one. 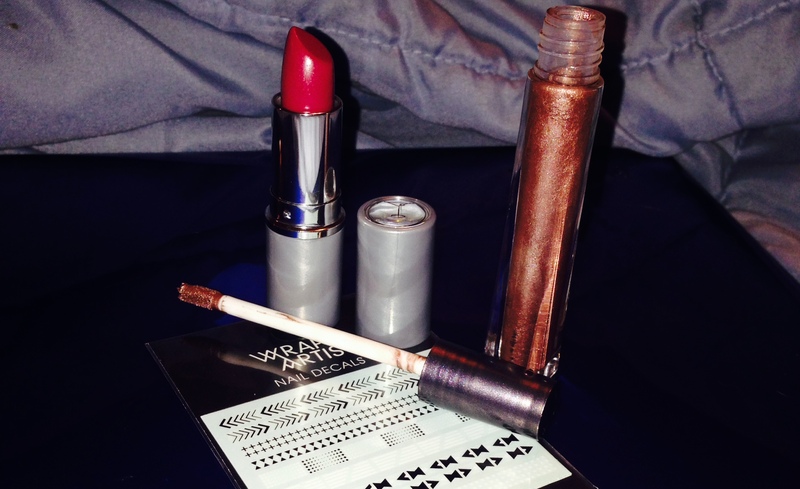 Inside the bag : a full size Pure Marcuja Oil rollerball – love this stuff! perfect skin pick-me-up full of vit C! A deluxe size Amazonian Clay Full Coverage 12-hr Foundation and SPF 15 Sunscreen – my current favorite liquid foundation! And a full size Gifted Amazonian Clay Smart Mascara – This is my first time trying this mascara by Tarte but I’ve loved mascaras of theirs in the past so I’m sure I’ll love this one too. Being on the summer bronzing kick that I’m currently on, I couldn’t pass up the Amazonian Clay and Annatto Body Bronzer. Applied with a delicate puff, this bronzer is waterproof! Perfect for when you get a little vain before the beach and/or pool. Can’t wait to put it to the test! And then, there are the two fabulous To-Go sets I nabbed! 1.) Tarte Prime, Shine & Define To-Go which included: Clean Slate Poreless 12-Hour Perfecting Primer, Amazonian Clay BB Illuminating Moisturizer and a mini version of the Gifted Amazonian Clay Smart Mascara. 2.) Tarte Golden Opportunity To-Go: Brazilliance Skin Rejuvenating Maracuja Self Tanner (which I’ve never tried but am excited to do so) and Amazonian Clay Bronzer in Park Ave Princess which is one of my favorite bronzers EVER! 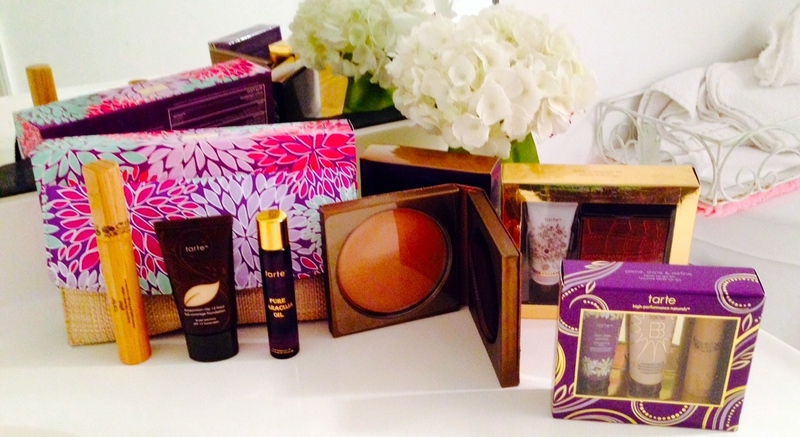 It was one of the first two Tarte products I became a devotee for. All these little to-gos are perfect for my summertime purse and beach bag! I’m looking forward to a beautiful summer! Thanks for reading! Urban Decay – 24/7 Velvet Glide-on Eye Pencil in Black – Urban Decay 24/7 pencils are my absolute favorite liners ever. 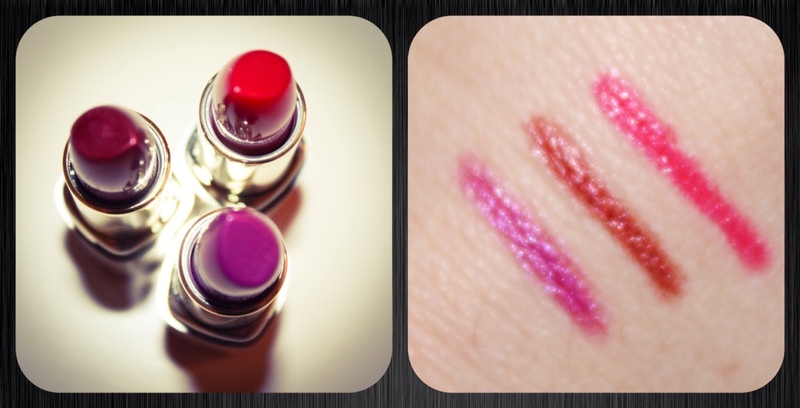 I am never disappointed to received these and always have them in my makeup case. Never a disappointed. I could complain that this product is nothing new and nothing out of my comfort zone as I did above with the Cailyn color but I don’t want to. I love these pencils and will never complain about getting them. I have them in many shades and colors and use them almost daily. Demeter – Roll on Perfume Oil in Jasmine – Not “wowed” by this product at all, it does smell nice… It smells like Jasmine. I find it a bit odd that Demeter encourages the use of multiple scents. I suppose it makes some sense: Why smell like Jasmine when you can smell like Jasmine and [blank]? I don’t know. I’m more of a one scent kind of gal. Not disappointed with this product but not excited about it either. Dr. Brandt – Microdermabrasion scrub – Like every scrub or lotion I receive from Ipsy, I’ll use it but I’m not thrilled about receiving it. It smells terrific! It feels really nice too. I also really like any Dr. Brandt product I’ve received but still not “wowed”. 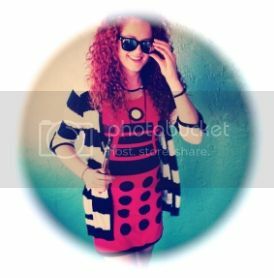 Elizabeth Mott – Pop! Goes the Shadow in Champagne – First of all, I’m getting bored with the Elizabeth Mott products; they’re not that great. Second, my eye shadow arrived completely broken up. It’s more of a dust shadow now. Such a huge disappointment. The color is nice and I hope to get to use it properly sometime but it’s a mess. I can’t even open it without losing product every time when it comes spilling out of it’s cheap container. Party foul, Ipsy. TokyoMilk Dark by Margot Elena – Slated Caramel Lip Elixir – This stuff is pretty amazing so far. It smells fantastic! It feels pretty fab too and even tastes great. My mom gave it a try and loved it also. I’m so happy with this product and love that Ipsy offers that points reward system to earn extra products but I shouldn’t have to rely on the extras to make my monthly experience worthwhile. This may have been the month I threw in the towel had I not received this lip elixir. One more gripe, since I’m griping: The selection of products that Ipsters can redeem their Ipsy points for needs to change more frequently. As of present, I have no other options allowed to me until they add a new item to choose from since I’ve gotten them all. And thats not because I do not want doubles, I would order another TokyoMilk Elixir in a second if I could. I have plenty of Ipsy points to spend and want to get my hands on more products! (Don’t we all?) The options seem to stay up on the site for months, perhaps until they sell out? Had it not been for the Urban Decay liner and the TokyoMilk Lip Elixir, I would’ve been a very unhappy Ipster this month. I’m pretty unhappy as is but I would’ve been uber disappointed otherwise. In other news: I posted last month about my car accident. My collarbone is almost 100% and last week I purchased a new-new car. I’m now rolling in a new VW Passat and feeling very grown-up! Thanks for the kind messages and emails while I was healing, it means a lot. After a bit of a rough patch, it seems things are coming back together nicely and I’ll have the pleasure of posting more frequently. Thanks again for reading and all the support! As part of my recent birthday beauty splurge, I bought two new lip glosses from Nars off of Sephora.com. The two shades I chose were Bad Education and Coup De Coeur. Bad Education is the perfect red gloss to top off a bold red lip. The other night I paired this gloss with my Rimmel Lasting Finish by Kate lipstick in Kiss of Life. (This is one of my favorite red lipsticks mostly because it has “Kate” written on it all pretty.) It look fantastic. A couple of reapplies though out the night, but a fabulous red lip! Coup De Coeur is a warm medium brown color with some red tones mixed in. I haven’t put this color to any “real” use yet but I can’t wait to do so. 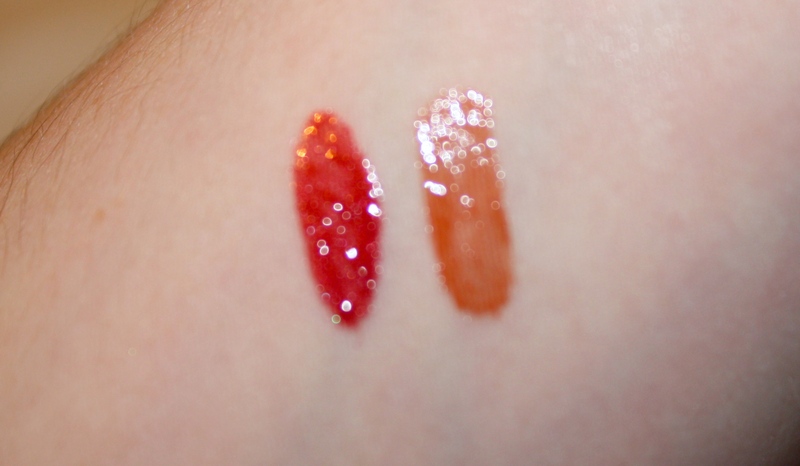 Both of these glosses were only $10 on sephora so I’m thinking Nars may be discontinuing them. Kind of a bummer, if thats the case, since both of these colors are fantastic. Below is a quick swatch on my very fair skin.